Easily smoke your own mouth-watering vegetables, nuts, fish, domestic meats or wild game. 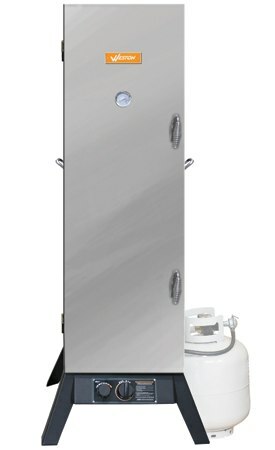 This smoker features a fully adjustable propane fuel delivery system with a rotary igniter for easy start up. 3 adjustable dampers help maintain the internal temperature and smoke quality. External temperature gauge accurately displays the internal temperature of the smoker. Four 14 ½” chrome plated cooking racks, a large porcelain-coated water pan, and a cast iron smoking box. Fully welded, heavy gauge, black-coated steel cooking cabinet features heavy duty carrying handles.